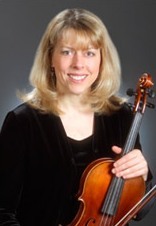 Mary E. M. Harris is Professor of Viola at Miami University in Oxford, Ohio, and member of the Oxford String Quartet at Miami. An in-demand performer, she is also principal violist of ProMusica Chamber Orchestra in Columbus, Ohio and violist of the Nexus String Quartet. In addition, she is a founding member of Cosmos, a flute, viola and harp ensemble dedicated to commissioning and performing new works for this combination. Cosmos’ recent recording, American Premieres on MSR Classics, features works written for and premiered by the trio to critical acclaim. A former member of the Dakota String Quartet and I Musici de Montreal, Ms Harris has served as principal violist of the New American Chamber Orchestra, touring Europe extensively and performing at the Korsholm, Casals, and other international festivals. She also served as principal of the Echternach Festival Orchestra in Luxembourg and has performed with the Garth Newel Festival in Virginia. For more than two decades, Ms Harris has spent her summers performing at the New Hampshire Music Festival and the Peter Britt Festival in Jacksonville, Oregon. She is a graduate of Indiana University (Bloomington), where she studied with Mimi Zweig and Georges Janzer. She holds M.F.A. and M.M. degrees from the Institute of Chamber Music at the University of Wisconsin in Milwaukee, where she studied and performed with members of the Fine Arts Quartet and performed on WFMT-Radio in Chicago.